Maybe it's the time of year or maybe my nesting is kicking in (we're expecting our second child in August!) or maybe I'm obsessed with great organizing products or maybe our 100-year old home needs regular tweaking to maximize non-existent storage space or maybe it's a combination of all of these realities that's pushing me to make some organizational improvements around our house. Whatever the reason, I find it extremely energizing and exciting when simple solutions and new systems improve the flow of space. 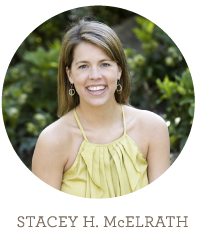 I plan to share these adjustments and products with you in the coming months, and my hope is you can use these tips and my experience to improve efficiency around your home or office. First up: the PerfectCurve CapRack 9. I love this product! And for $4.99 per rack...talk about low cost, high impact! This system was simply not working. The door couldn't be closed completely because the hats were overflowing on either side, and finding the perfect hat was a chore. Whether I'm working with a client or in my own home, the first two steps are always the same: consider the needs & habits of the client (my husband, in this case), then sort & purge. Asking a hat collector to give up two-thirds of his collection so I can close the closet door is an attempt to change the client...not productive at all. Instead, I need to change the environment in which the client operates. Change the system, not the individual. After considering the size of the door and doing some product research, I landed on the PerfectCurve CapRack 9. 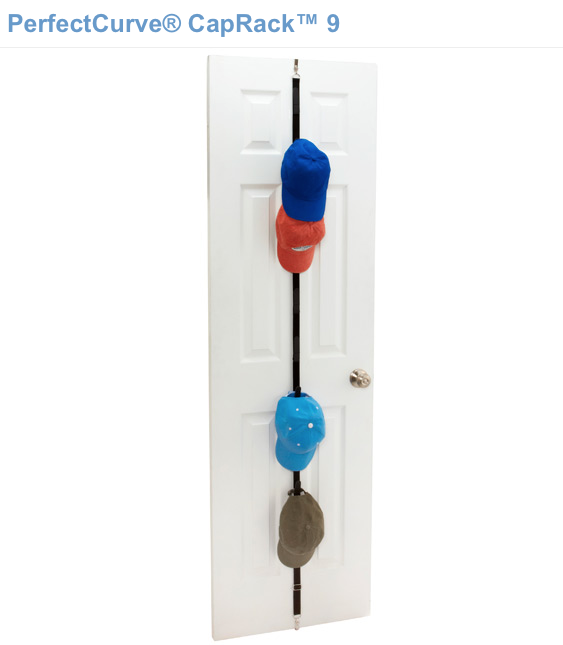 I could easily fit two racks side-by-side inside the closet door, allowing my husband up to 18 hat hooks. Done and done! 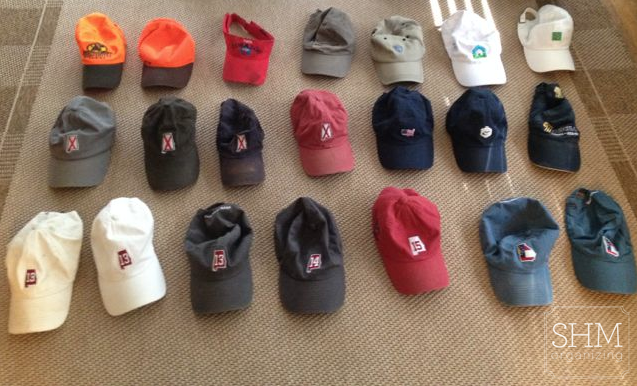 After sorting his hats, my husband quickly realized he had some duplicates, so donating three hats to get to 18 was the perfect compromise. It's important to respect the "real estate" you have. In other words, you don't have more space than the space you have. When these limits are not acknowledged = clutter. Now we're on a one in/one out system. 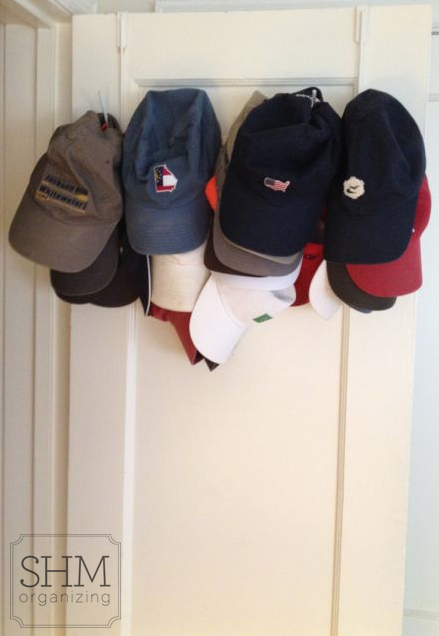 The new hat racks are maxed out, so if a new hat is desired then an existing hat must be donated. The hats stay firmly in place on the hooks! If you have similar head gear needs, I highly recommend the PerfectCurve CapRack 9! Or do you use another great system? Let me know - I'd love to hear from you! Screws are included with this product if you'd prefer not to have hooks showing on the outside of the door. As information, the PerfectCurve BagRack 9 was not a winner. 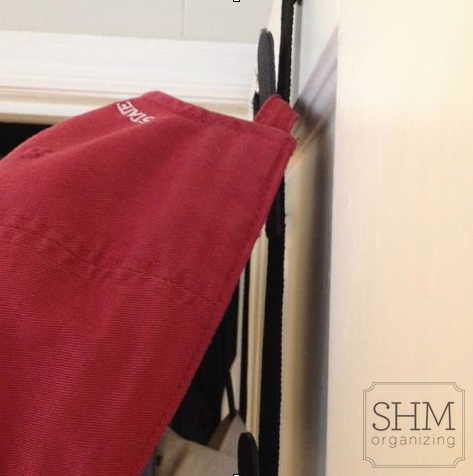 I tried it out for my purses and hats, and the hooks were not strong enough to hold my purses in place, especially when I opened or closed the closet door. Back to the drawing board on that one! And in case you missed it, SHMorganizing's services have expanded! Need help organizing and clearing out your inbox, want assistance managing your calendar and appointments, don't have the space, time or budget to hire a full-time employee, just need help on an "as needed" basis? SHMorganizing is now offering virtual assistance. Contact me for more information or to schedule a consultation! Disclaimer: The views expressed in this post are mine alone. I have not been compensated in any way to review or promote these products.